"The mission of the Bloomfield Hills School District is to empower learners to become architects of their futures building on a foundation of: scholarship, citizenship, integrity, trust, service, respect for self and others with joy and passion for learning." The sixth-grade language arts program at West Hills will allow students coming into middle school to develop a vast array of reading and writing skills. Students will be exposed to intrapersonal, interpersonal, visual and other learning strategies that will allow them to master concepts. Through various measures, including word attack skills and comprehension strategies, students will improve their overall reading ability. Students will also be exposed to narrative and expository text that will enable them to tie other curriculum into their reading and writing. A wealth of writing skills will be introduced and students will be expected to produce persuasive, biographical and other writing genres that will apply to their community. In addition, sixth-graders will develop their ability to listen and express their viewpoints. They will also gain respect and understanding for the viewpoints of others. Students will be assessed using an assortment of tasks that will allow them to express their knowledge via tests, projects, extended responses and oral communication. The seventh-grade English- Language Arts curriculum expands the development of literacy through each of the areas of Language Arts. It serves as a continuation of the knowledge gathered in sixth grade and as a bridge to what students will learn in eighth grade. A variety of learning strategies will be taught that can be applied to gaining knowledge in all subject areas. Where appropriate, the Language Arts are linked to the content of the seventh grade Eastern World Social Studies curriculum. Students will be introduced to a plethora of informational and narrative texts. They will write personal essays, autobiographies, poetry, and a research report. Journal entries, designed to answer specific questions, will help students gain a better feel for the writing process. In addition, the class will continue to focus on problem and solution, cause and effect, and sequence. Seventh graders develop their ability to listen, speak, and view by delivering oral presentations. Through the use of contemporary and classic literature and other texts (e.g. essays, magazines, newspapers, etc.) from our common culture and other cultures around the world, seventh graders explore a variety of topics in the units of study. The design of 8th grade language arts emphasizes students acquiring and refining the linguistic skills necessary to express their ideas effectively. Students are also encouraged to find meaning and value in the words of others. Participation in this class allows students to see the power of language, as well its importance in the rapidly growing means by which we communicate. A variety of methods of instruction will be used, including but not limited to various textbooks and articles, homogeneous gender/ability/interests groupings, videos, class speakers, overhead presentations, photos, charts/graphs/, traditional homework, lectures, text reading, group discussions, games and competitions, simulations, peer conferencing and teaching, student-centered inquiry, journaling, self-reflection, and debates. Among the methods of assessment are performing skits, traditional essay and objective tests, class discussions, essay writing, journals, daily homework, videotapes, oral reports, and projects. The West Hills Middle School mathematics curriculum follows the State of Michigan Benchmarks. Mathematics in sixth grade at West Hills Middle School will focus on integrating math into our students' daily lives. Students will apply their knowledge of mathematics to incorporate problem solving using real-world situations. This will promote higher-level thinking and oral/written communication skills. Multiple teaching techniques will be incorporated into the classroom, including lecture and small group discussions. Students will participate in math investigations, math manipulations and simulations. Group and individual activities will include the creation of models, diagrams, projects and presentations. Students will design and present projects in front of their peers. Students will be exposed to a variety of resources including worksheets, textbooks, overheads, web resources, computer programs (such as Geo Sketch Pad), and presentations. In mathematics, students will be communicating ideas in a variety of ways. Besides traditional paper and pencil work, students will need to communicate mathematical understanding by writing. Students will be assessed by daily homework, class participation, notebook organization, projects/presentations, and tests and quizzes. The West Hills Middle School mathematics curriculum follows the State of Michigan Benchmarks. Mathematics in seventh grade at West Hills Middle School will focus on integrating math into our students' daily lives. Students will apply their knowledge of mathematics to incorporate problem solving using real-world situations. This will promote higher-level thinking and oral/written communication skills. Multiple teaching techniques will be incorporated into the classroom, including lecture and small group discussions. Students will participate in math investigations, math manipulations and simulations. Group and individual activities will include the creation of models, diagrams, projects and power point presentations. Students will design and present projects in front of their peers. Students will be exposed to a variety of resources including worksheets, textbooks, overheads, web resources, computer programs (such as spreadsheets), and presentations. In mathematics, students will be communicating ideas in a variety of ways. Besides traditional paper and pencil work, students will need to communicate understanding by writing. The West Hills Middle School mathematics curriculum follows the State of Michigan Benchmarks. Mathematics in eighth grade at West Hills Middle School will focus on integrating math into our students? daily lives. Students will apply their knowledge of mathematics to incorporate problem solving using real-world situations. This will promote higher-level thinking and oral/written communication skills. Unit 1: Data and Probability using samples to reason about populations and make predictions; comparing samples and sample distributions. Unit 2: Linear relationships in tables, graphs, and equations; introduction to functions; slope, y-intercept, and finding the equation of a line; non-linear models and quadratic equations; use of the Graphing Calculator. Unit 3: Investigation of the Pythagorean Theorem, area, irrational numbers, slope and distance. Unit 4: Exponential growth through data tables, graphs, and symbolic forms. Unit 5: Investigating quadratic growth and quadratic functions. Unit 6: Investigating equivalent expressions; solving linear equations. Pythagorean Theorem and square roots. Inequalities in one and two variables. Compound inequalities. Graphing linear inequalities. Solving systems by graphing, substitution, addition (linear combinations). Square roots, radicals, and Pythagorean theorem. Powers and exponents, negative and zero exponents. Scientific Notation. The sixth grade science curriculum allows students to develop the knowledge and skills they need to become scientifically literate. Units of study incorporate the State of Michigan Science Grade Level Content Expectations . Methods of instruction include small and large group work, science labs, textbook reading, lecture and the use of appropriate technology. A variety of approaches to methods such as note taking, summarizing, organization strategies, mnemonic devices, timelines and group skills are taught and students are encouraged to use strategies that enhance their comprehension. The types of learning resources used include textbooks, computer technology, online video resources, field trips and science lab materials. Student learning is assessed both formally and informally on a daily basis. Examples of informal assessment are group discussions and daily class work. Formal assessment methods are quizzes, tests, written reflections, oral presentations, and long term projects. Note: The State of Michigan Grade Level Content Expectations for science is preparing to change, so the science units of study may change as well. Seventh grade science is a continued introduction and exploration in the areas of physical, biological, and earth sciences according to the State of Michigan Science Grade Level Content Expectations . Students focus on the integration of science into their daily lives. Students identify the interrelationships through classroom discussions and explorations between the biological and physical worlds in which they inhabit, as well as the world around them. Multiple teaching techniques are integrated into the classroom on a daily basis. Independent, team, and cooperative learning take place everyday, as well as small and large group discussions. Students participate in various labs and hands-on projects. Group and individual activities include the creation of models, diagrams, song-writing, skits, and several projects that integrate various pieces of technology. To enhance classroom discussion, field trips and guest speakers are imbedded into the seventh grade science program as well. Students focus on how technology, math, and science work together in the real-world, and construct and reflect on scientific knowledge gained throughout the year. Methods of assessment include: written tests and quizzes, homework, labs, projects, and oral presentations. The eighth grade science curriculum focuses on Physics, Chemistry and Earth Science. The Michigan Science High School Content Expectations direct the topics of study for eighth grade students in all three middle schools. A variety of materials are used to help students construct and reflect upon their learning. These resources include lab equipment, online videos and information services, teacher-generated materials, textbooks, and class discussions. Students will encounter a variety of approaches to this learning including: scientific labs, small group discussion, teacher-directed presentations, projects, model, and online inquiries. Students will respond to this learning in both oral and written form, including reports, journals, notes, and graphic organizers. Students will be assessed informally through their performance during labs, discussions, projects, and group work. In addition to teacher-designed quizzes and tests, formal assessments will also include three District-wide Common Assessments, MYP Criteria Assessments, and the MEAP. The scientific method is embedded throughout each unit as students gain practice in observing, measuring and communicating their findings. Problem solving, group decision-making, making inferences, and drawing conclusions are among the cognitive skills that are practiced during each activity or lab. Cooperation, innovation, and responsible risk-taking are among the social skills that are also practiced during each activity. Scientific Method How can scientists get data that they can trust? Hydrogeology How does water require communities to depend on each other? Plate Tectonics, Volcanoes and Earthquakes Who is affected by changes in the Earth's surface? The Earth as a Closed System How can change in one system affect other systems? Climate Who owns the atmosphere? Chemistry How can changes in matter change our lives? Waves and Sound How might communication technology change in my lifetime? Light How can something invisible change something that is visible? Energy How can we use our creativity and scientific knowledge to power the world? Forces and Motion How do forces work together to cause change? Students manipulate information and ideas by synthesizing, generalizing, explaining, hypothesizing, or arriving at conclusions that produce new meaning and understanding for them. Instruction explores connections and relationships among disciplines and topics to produce relatively complex understandings. Students engage in extended conversational exchanges with the teacher and/or their peers about subject matter in a way that builds an improved and shared understanding of ideas or topics. Students make connections between substantive knowledge and personal experience, social problems or public policy. Students consider ethical dimensions of a topic and apply democratic values when making judgments regarding matters of public concern or personal conduct. Instruction links social studies to other subject areas, integrates knowledge and skills, and includes effective use of technology in order to build social understanding and civic competence. Examples are religious liberty, free expression, property rights, privacy, due process of law and equality are used to reinforce the skills and attitudes necessary to be responsible citizens in a constitutional democracy. The sixth grade social studies curriculum introduces students to cultures of the West. Emphasis is placed on the contemporary geography of Europe, Canada, and Latin America. Students study the geography of each of these world regions; explore cultural and natural features that characterize each region; trace the movement of people, ideas, and products within the regions; and discover ways that each can be divided into sub-regions. Historical background is provided to enable students to understand how these regions developed from the past to the present. Differences in governments and economies are examined. The economy of each region and its role in the global economy is explored; special attention is paid to economic ties with the United States. Students study public issues of global significance in these regions and work to resolve them through analysis, discussion, and writing. Using a variety of media, students compile, analyze, and present geographic and economic data pertaining to the regions. They also consider what actions they and their country should pursue to promote the well-being of people who live in these regions. Students are assessed through daily homework, projects, essays, oral presentations, tests and participation. The seventh grade social studies curriculum introduces students to cultures of the East, with emphasis on the contemporary geography of Africa, Asia, the Middle East, and Oceania. Through the study of geography students learn the locations of significant places in each of these world regions; explore cultural and natural features that characterize each region; trace movement of people, ideas, and products within the regions; and discover ways that regions can be divided into sub-regions. Historical background is provided to enable students to understand how a region developed from the past to the present. Differences in governments and economies are examined. The economy of each region and its role in the global economy is explored with special attention paid to economic ties with the United States. Students examine public issues of global significance in these regions and work to resolve them through study, discussion, and writing. Using a variety of media, students compile, analyze, and present geographic and economic data pertaining to the regions. They also consider what actions they and their country should pursue to promote the well-being of people who live in these regions. In addition to using media, teachers will use a variety of teaching and learning methods to produce a climate where students can discover and excel however they learn best. Assessments will include daily notes, journal writing, study of current events, written reports, presentations, role-playing, hands-on projects and traditional quizzes and tests. This course introduces students to the history of the United States from the ratification of the Constitution to the beginning of the twentieth century. The course is divided chronologically into eras. Students learn to place major events on a timeline and to analyze their causes and effects. Using primary and secondary sources, they explore time and place in nineteenth century America. They compare conflicting accounts of the past and, both orally and in writing, express informed judgments about significant events that shaped the nation. Using a variety of media, they compile, analyze, and present historical data. Within their historical study of nineteenth century America, students deepen their understanding of major geographical themes and basic economic concepts. They also build their understanding of American government from in-depth study of the United States Constitution and the evolution of the government it created during its first century. Students are assessed through daily homework, projects, essays, oral presentations, tests, and participation. MYP Technology focuses on solving problems in an effort to stimulate students' ingenuity and to encourage them to combine intellectual talents and practical skills. MYP students are encouraged to display ingenuity and creativity in devising practical solutions to given tasks. 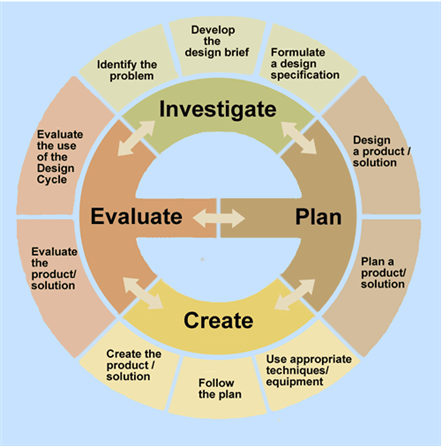 The design cycle is the process by which students are taught to systematically develop and refine ideas and solutions. This subject area is valuable for reinforcing and integrating skills learned in other disciplines, especially in the presentation and handling of data and the processes involved in the design and manufacture of a product. At the same time, it fosters awareness of the social and ethical implications of technological development. West Hills employs the latest instructional technology to achieve these goals. Students are instructed in and have ready access to three PC labs, Mac laptops and all of the necessary supporting hardware and software. Students also receive direct instruction in using practical design and fabrication tools through the Unified Arts program. Digital art tools and techniques are also an important part of the technology experience at West Hills. Definitions are from the "Technology MYP Workbook" by Dilip Dutta. Sixth grade is the final opportunity for students to begin an instrument in the band or orchestra program. The Instrumental Music Program at West Hills Middle School is a sequential program that teaches students to play a band or orchestral instrument through the intermediate level. Students are given instruction in the areas of performance, music literacy, listening, analysis, and music history. During this process, students learn to make connections between music of different cultures, and other disciplines. Each instrument is demonstrated to students. Students learn about the history and technology of the instrument, the care of the instrument, and the fundamentals of playing the instrument. Students learn to read and identify notes and perform them on their instrument. The aim is for students to play with a characteristic tone using correct articulations, phrasing, and dynamics. Instruction is given in rhythmic reading with attention given to understanding of time signatures. Students learn musical terminology, key signature, scales, and ensemble skills. They perform as soloists, and as an ensemble, and in both settings experience the necessary steps to achieve excellence. Students will leave West Hills ready for their high school experience. They will also develop skills to enable them to be life-long learners and lovers of music. Everyone can sing! Each choir student has the opportunity to explore and develop his or her abilities. Building on the foundation of the elementary music curriculum, emphasis is on fundamental music skills, basic theory, notation, and sight singing, singing on pitch, and singing in parts. Vocal skills and choral ensemble skills are high priorities. Students will develop an appreciation for the arts, gain and refine musical skills, and contribute positively to the musical team. This exploratory course introduces students to many of the components of Technology Education and safe workshop operation. Students have an opportunity to learn about the areas of Industrial Arts and Technology, as well as related careers. The demonstrations and projects are practical applications for the proper use of tools in the classroom. Students use their creativity within guidelines. Lessons incorporate history and technological advancements. Students participate in self-assessment and group assessments in this area. All work is detailed, challenging, and fun. Every student can succeed in this course. All sixth, seventh and eighth grade students participate in the Physical Education Program. Students participate in a variety of team and individual sports experiences. Emphasis is on teamwork, physical development, and social growth. Students learn to respect competition while gaining knowledge and skills of lifelong activities. Students are assessed through national fitness norms, daily participation, effort, and written reflections. Units of Study include Soccer, Ultimate Frisbee, Cross Country Running, Basketball, Pickle ball, Volleyball, Floor Hockey, Team Handball, Badminton, Wall Climbing, Presidential Physical Fitness, Writing Reflections, Kickball, and Flag Football. French 6 is an introductory course. Students learn the fundamentals of the French language, essential vocabulary, and acquire listening and speaking skills. Students become familiar with basic grammatical concepts, such as the conjugation of regular verbs. Assessments will include dialogues, written tests, and projects that allow for student creativity and expression. No prior experience with French is necessary. The basic requirements are an open mind and a desire to learn French! In order to qualify for an MYP certificate at the end of grade 10, students must take the same Language B class (French or Spanish) in grades 6 - 10. Throughout this year, students become familiar with Spanish fundamentals through thematic units. They learn to appreciate the diversity among people in Hispanic countries and learn about their cultural practices and traditions. Students learn essential pronunciation and grammar skills through activities, projects and oral presentations. Students play educational games, perform skits, and enjoy watching videos in Spanish. Project assessments include written and oral assessment. A Spanish program highlight includes the production of a fashion show to complement a unit on clothing and colors, and "Feria de Compras", in which students enjoy an afternoon of shopping in our Mexican Bazaar. All West Hills students experience the hands on lessons taught in survival skills. Multiple instructional strategies provide students with the opportunity to achieve success and develop life management skills that will benefit them throughout their lives. Specific units include babysitting, designing a multicultural doll, laundry techniques, and healthy eating through food group analysis. Students make connections to the outside world through career exploration. This introductory course focuses on creating works of art with mainly 2-D materials. It introduces the Elements and Principles of Design, which serve as a foundation and carry through all other art courses. Exploration of media may include: drawing and painting, collage, and design. Students have an opportunity to learn about the fine arts and commercial arts as well as related careers. Projects and exercises are intended to serve as outlets for creative self-expression. Historical and cultural aspects, as well as the relevance of other disciplines will be explored through connections made in the MYP program. Students take part in constructive critiques and they reflect upon their creative experiences in brief writing assignments. All work is challenging yet fun. Every student has the opportunity to succeed! This is not your typical Drama class, as the focus of this one-semester class is the dramatic portrayal of a sensational criminal trial. Students are introduced to courtroom drama as they amass an abundance of information on courtroom procedure and due process of law. After becoming familiar with important courtroom vocabulary, listening to professionals share their exciting experiences, and acquiring information about the numerous career opportunities available, the students have the opportunity to visit the Oakland County Courthouse to view actual criminal trials. The content of this class transcends beautifully into other disciplines as we explore what our rights and responsibilities are as part of a democratic judicial system. As we create our personalized scripts and assume the roles of the various figures in a famous trial, a criminal case from the past comes to life on the West Hills stage. French 7 is an continuation of the French 6 introductory course. Students learn the fundamentals of the French language, essential vocabulary, and acquire listening and speaking skills. Students become familiar with basic grammatical concepts, such as the conjugation of regular verbs. Assessments will include dialogues, written tests, and projects that allow for student creativity and expression. Students expand their creativity and work more independently building upon their technology skills from the introductory course. They learn to choose the appropriate tools and materials for their work. Students make choices regarding independent research on a given topics. They use various techniques to make their projects. Part of their understanding is that they may make the same product using alternative techniques. Course goals include students gaining confidence in using a variety of tools, working in groups, problem solving, and developing safe work habits. Students take part in group assessments as well as self-assessments. All work is detailed and enjoyable. This course encourages all students to succeed. This course is a continuation of the introductory art class. Emphasis is on drawing and painting. Projects may include collage, printmaking and digital graphic design as time permits. Students have an opportunity to learn about the fine arts and commercial arts as well as related careers. Projects and exercises are intended to serve as outlets for creative self-expression. Historical and cultural aspects, as well as the relevance of other disciplines are explored through connections made in the MYP program. Students take part in constructive critiques. They also reflect upon their creative experiences in brief writing assignments. All work is challenging yet fun. Every student has the opportunity to succeed! Life Skills builds upon the skills exposure given to all 6th graders in Survival Skills. Well-planned tasks require students to define, locate, select, organize, present and evaluate information. Concentration is on individual creativity and the impact on society. Students learn to recognize the extent of technology in their surroundings and in the world. Content includes food preparation, nutrition, consumerism, decision-making, communication, as well as technology and design in clothing construction project. All students participate in this whole language learning experience using the text "Expresate" and its supplementary materials. Students become acquainted with Spanish grammar and vocabulary skills. They also gain abundant knowledge of the diverse cultures found in the Spanish-speaking world. Students learn interesting facts about family roles, dining habits, holiday celebrations and social mores as they learn to successfully communicate in Spanish. Skit presentations, educational games, videos in Spanish, written quizzes and unique projects create a successful program. This class promotes an appreciation of cultural differences and similarities. This is an advanced art course with an exploration of different materials, both 2-D and 3-D. There is a focus on drawing, painting, collage, digital manipulation and mixed media. Experimentation and extended-length assignments are emphasized. Projects and exercises are intended to serve as outlets for creative self-expression. Historical and cultural aspects, as well as the relevance of other disciplines are explored through connections made in the MYP program. Students take part in constructive critiques. They also reflect upon their creative experiences in brief writing assignments. All work is challenging yet fun. Every student has the opportunity to succeed! The Instrumental Music Program at West Hills Middle School is a sequential program designed to teach the student to play a band or orchestral instrument through the intermediate level. Students are given instruction in the areas of performance, music literacy, listening, analysis, and music history. During this process, students will learn to make connections between music of different cultures, and other disciplines. Each instrument is demonstrated to students. Instruction is given in the history and technology of the instrument, the care of the instrument, and the fundamentals of playing the instrument. Students learn to read and identify notes and perform them on their instrument. The aim is for students to play with a characteristic tone using correct articulations, phrasing, and dynamics. Instruction is given in rhythmic reading with attention given to understanding of time signatures. Instruction is given for students to understand musical terminology, key signature, scales, and ensemble skills. Students perform as soloists, and as an ensemble, and in both settings experience the necessary steps to achieve excellence. They will leave West Hills ready for their high school experience, as the skills to enable them to be life-long learners and lovers of music. This course focuses on creating 3-D works of art. There is an emphasis on ceramics, but projects may also include sculpture, jewelry/metals, model building and mosaic as time permits. Students have an opportunity to learn about all three clay hand-building techniques: pinch, coil, and slab construction. Students learn about related careers. Projects and exercises are intended to serve as outlets for creative self-expression. Historical and cultural aspects, as well as the relevance of other disciplines are explored through connections made in the MYP program. Students take part in constructive critiques. They also reflect upon their creative experiences in brief writing assignments. All work is challenging yet fun. Every student has the opportunity to succeed! Students gain confidence with the exposure of performing in class. Their skills in front of an audience expand in acting, pantomime, movement, and memorization. Script writing and directing are explored. Students learn stage terminology and stage directions. They memorize and perform roles. Students may be able to earn the opportunity to perform in a play. This course focuses on drawing, painting and mixed media. Extended-length assignments are emphasized. Projects and exercises are intended to serve as outlets for creative self-expression. Historical and cultural aspects, as well as the relevance of other disciplines are explored through connections made in the MYP program. Students take part in constructive critiques. They reflect upon their creative experiences in brief writing assignments. All work is challenging yet fun. Every student has the opportunity to succeed! This course is a continuation of French 7 and meets every day. Students will expand their thematic vocabulary, and practice their listening and speaking skills. They will build upon their basic grammatical concepts, such as adjective agreement and the conjugation of irregular verbs. Assessments include written tests, dialogues, and projects. MYP units explore the Areas of Interaction with a focus on cultural influences. Students read and perform a short play during a final unit of study. This course focuses mainly on creating works of art digitally. There is an emphasis on digital photography and photo manipulation using computer software, as well as mixed media as time permits. This course focuses heavily on careers in the commercial arts. Projects and exercises are intended to serve as outlets for creative self-expression. Historical and cultural aspects, as well as the relevance of other disciplines are explored through connections made in the MYP program. Students take part in constructive critiques. They reflect upon their creative experiences in brief writing assignments. All work is challenging yet fun. Every student has the opportunity to succeed! This workshop type course explores the art form of the American Musical. Students study how the Musical reflects the culture of America. They make historical connections between the time period of the musical and the performance on stage. They also make production decisions based on the their study of characters and storyline. Students use the vehicle of the musical production to build relationships and learn to respect others. As the semester progresses, each student is involved in singing, acting and dancing as a part of the final production. This is a fantastic class for the 8 th graders before they move on to high school. Spanish at the eighth grade level reinforces all the necessary tools for effective communication. Students learn more advanced language learning skills. They become increasingly more aware of how language is created and how languages affect each other. Students add to their knowledge of Hispanic culture, customs and traditions using the text Exprésate and its supplementary materials. They learn how the contributions of famous Hispanics have helped to shape our society, through art, music, politics, education and sports. One highlight of this year's Spanish study is a luncheon at a Spanish restaurant, including a salsa and flamenco lesson. Students learn basic drafting processes and techniques in this course. They learn to use drafting instruments and equipment to make mechanical and basic architectural drawings on paper. Learning to draw is an important aspect of this course. Students create precision drawings, and learn about practical applications in the areas of construction and residential building. All projects are challenging, enjoyable, and all students have the ability to excel. In this course students expand their creativity and work more independently, using the technology skills they develop in the introductory courses. They learn to choose appropriate tools and materials for their work. Students make choices through independent research on a topic. Students learn to recognize different methods of making the same product and how to apply the appropriate materials and techniques. Students develop proficiency in machine use, shop practices and safety. By the end of the course, students gain confidence and work safely using a variety of tools. They work in groups, problem solve, participate in group assessments as well as self-assessments. All work is detailed and enjoyable. This course allows all students to succeed. Students expand their creativity, work independently and use the technology and woodworking skills they acquired from the introductory courses. They learn to choose appropriate tools and materials for their work. Students make choices regarding independent projects, including planning and layout. They learn to recognize different methods of making the same product and how to select the appropriate techniques including finishing methods. By the end of the course, students gain confidence and work safely using a variety of tools. They work in groups, problem solve, participate in group assessments as well as self-assessments. All work is detailed, yet enjoyable. This course allows all students to succeed. Nutrition and Foods promotes the physical, social, emotional, and intellectual development of students. Students work on many interdisciplinary units linking practical learning skills to the world around them. Units include safety/sanitation, foreign foods, cake decorating, nutrition and food evaluations and hands-on practical lab experiences. The final project consists of a breakfast planned by students for their parents. Students investigate, plan, and evaluate a community service project. All students make lifelong learning connections and participate in various career exploration experiences. Emphasis is on selection, purchase, use, and care through clothing construction that meets individual needs and interests. Students develop practical skills through the creation of various projects. The course encourages awareness of the impact of technology on society and the environment. Fashion design and career development are incorporated.